From coast-to-coast, Canada is blessed with beautiful, livable cities. It's something that we pride ourselves on. Each city has some colours that are naturally associated with it. Allow us to make some suggestions for each of Canada's largest metro areas. These arrangements speak to the history and tradition of each city's history. 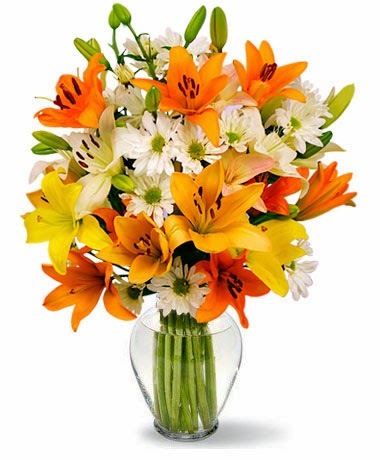 Vancouver - Celestial Lilies Bouquet: The orange, white and yellow pays homage to the city's sporting history. $69.95. Calgary - Crimson Delight: Cow-town loves their red, and this delightful bouquet sums up the city's history nicely. $29.95. 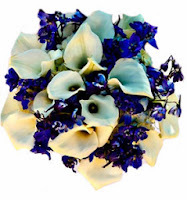 Edmonton - Pure Devotion: "The City of Champions" in Northern Alberta has certainly been devoted to their hometown squads over the decades, and this blue and white bouquet with notes of cream is a tribute to the glory years. $34.99. Regina/Saskatoon - White Blooming Planter Basket: Show your Saskatchewan pride with this green and white basket, a beautiful arrangement evocative of the province's rich agricultural history. $45.95. Winnipeg - Beautiful in Blue: Blue and white, with a dash of yellow Crysanthemums perfectly sums up Winnipeg's love of their local teams, from the gridiron to the ice. Hamilton - Sunshine Sunflowers: This arrangement notes this hard-working city's long-lasting infatuation with their sporting pride, while fostering an artsier side with recent gentrification and urban development. $49.95. Toronto - Blue and White Joy: Canada's largest city has been associated with the colours blue and white, and even the city's flag contains those colours. $84.95. Ottawa - Signature Arrangement: With red and yellow, our Signature Arrangement perfectly sums up our Nation's Capital. $59.95. Montreal - Endless Love: The name of this bouquet certainly represents Montreal's loyalty and devotion to their sports heroes, and red and white carries historical connotations in the city. $84.95.